Usually, people associate backpacking with budget travel, and that is a big misconception. Carrying a backpack (only) and lesser clothes doesn’t mean you can’t stay in luxury 🙂 Narayanan and I are the kind of travellers who love to experience everything, right from hostels to luxurious resorts across the world. Usually, we end up coupling a good mix of both but this time around, we decided to pamper ourselves with a “luxurious vacation”. By luxurious vacation, I mean booking a fancy resort and resting for a few days. We picked The Windflower Resorts & Spa, a 5-star beach resort in Pondicherry. This beautiful 5-star beach resort is located on the coastal side of Pondicherry and to get there, you have to pass through a small village. Nestled a tad away from the place of action in Pondicherry, this resort has access to the beach. We chose to stay here for a weekend and relax with another friend couple. As we stay in Chennai, we took our car and drove all the way to reach this resort. Note: Apart from Pondicherry, the Windflower has resorts across the country – Bangalore, Bandipur, Coorg, Vythiri and Mysore. 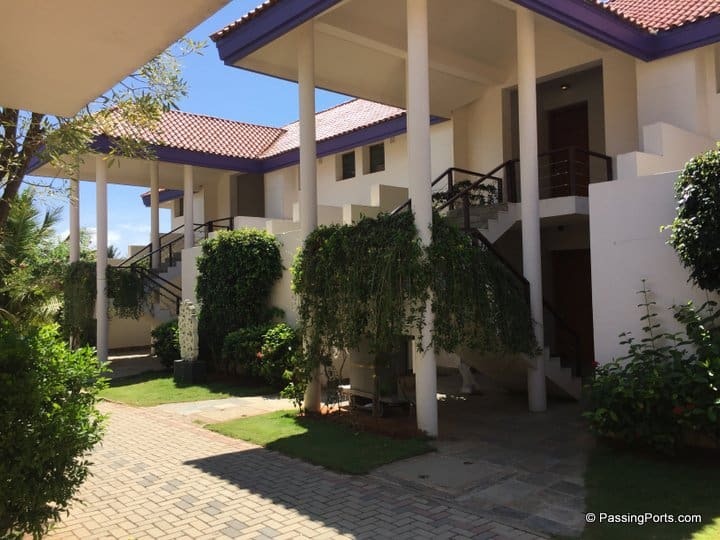 Located between the Chunnambar River and the Bay of Bengal, the Windflower Pondicherry is situated off the Cuddalore Road, and away from the hustle and bustle of the beautiful French town. While you have to cross a small village to reach the resort (yes, narrow roads), the property captivates you with its elegance and the peaceful Buddha right at the entrance. There are fifty-one rooms in the Windflower Resort Pondicherry that are categorised as Studio, Suite and Villa; and you can choose which category works well for your stay. However, given that it is almost always fully booked, one ends up choosing whatever is available at that point in time. We had a choice between the Suite and the Villa and we picked the Suite (pic above). The Suite room was beautiful. As you can see the room is spacious and comfortable, designed to help one relax and enjoy their vacation. Loved the walk-in closet, and the mattress was just perfect – not too soft and not hard as well. Since we went with friends who were staying in the next room, we took complete advantage of the interconnected balconies, shuttling from one room to another. That said, we had a few issues as well. Listing them out here. The open air shower in our Garden Suite was littered with used tetra packs (guess someone threw them from the floor above. While we did request the housekeeping to clean up the place, they forgot and we gave up. Even worse, in the room where our friends were staying, there was a used kid’s diaper in the bin, leftover from the guests who stayed earlier. The AC did not work in our room and yes, it was very irritating. Given that all we wanted to do was sit and relax, we would have loved it if we had been offered a room with no faults. They started fixing it at about 7pm and then offered to shift us to a villa (only to sleep) at around 11.30pm. Thankfully, our friends occupied the room next door. We did end up wasting time unpacking and repacking in the middle of the night and then had to shift back again, in under 12 hours. Yes, that sucked, and there wasn’t much help offered by the resort. Even worse, the staff who took us to the Villa Room (the so called upgrade) forgot to give us the key card. We called the reception and waited for over 20 minutes and then just hit the bed when we realised that they weren’t coming. The pool and the garden in the Villa room were dirty. This is when we realised that “the upgrade” wasn’t really an upgrade. Even worse, they switched off the AC when we were getting ready to switch back to our original room. This was a big bummer. We did complain to the manager to which he simply responded by saying that he will check and come back. He never did. Guess these guys forget a lot. The WiFi was horrible. It kept disconnecting, so we just switched that off and used our data plan. There was a function taking place on their lawn on the second night of our stay. Imagine loud music, people speaking or rather screaming on the mics and playing. Our rooms were close to the lawn. Sigh again. Given that the Windflower Resort Pondicherry is a little away from civilisation, it is but natural to expect a good spread and excellent food. As far as the quality of food is concerned, Windflower Resort Pondicherry is pretty good. The breakfast spread is more than satisfactory, with a decent spread of South Indian, North Indian and Continental cuisine. Dinner, however, was quite the opposite with a very limited menu. 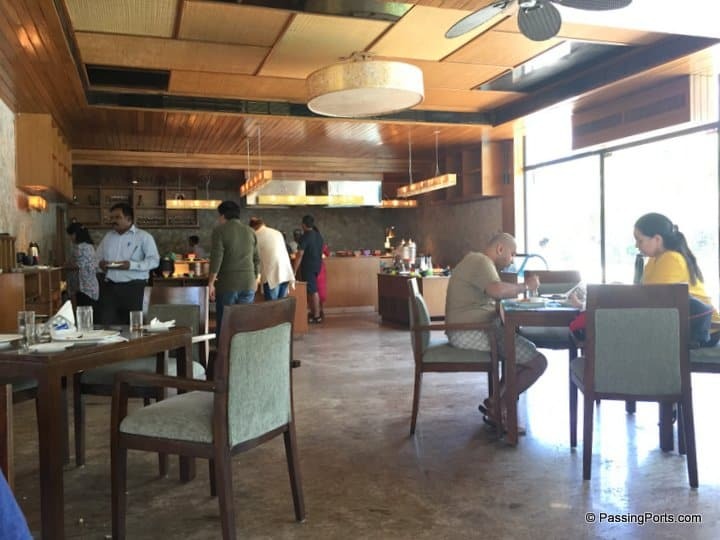 Given that they call themselves a 5-star beach resort, they could do much better.We never got a chance to eat lunch since we had our own favourites in Pondy (New Farm Fresh on day one and Tantos on day two). Special mention: Ganesh, one of the members of the staff at the restaurant was really helpful and always made sure we were well attended, including taking care of our special requests. 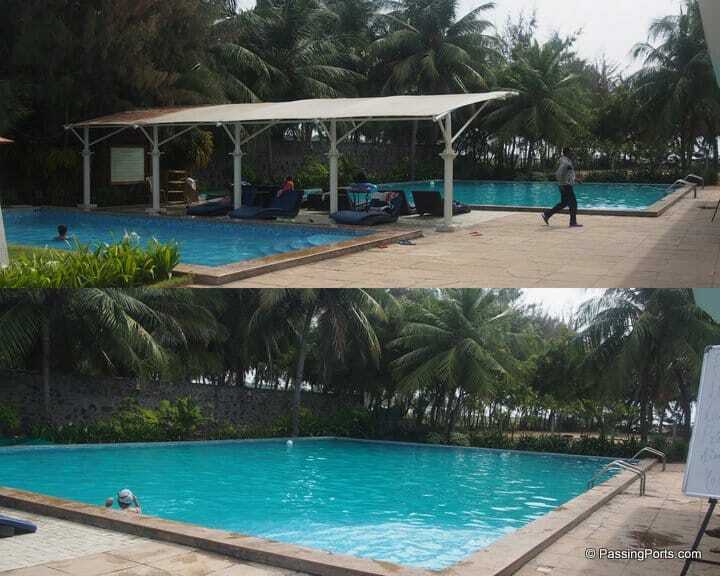 What I really love about Windflower Resort Pondicherry is their swimming pool. Big and clean with not much chlorine to leave your eyes burning. Once the sun was out in full force, we switched to playing table tennis. There was a volleyball court which we didn’t make use of. Other than that, the resort also offers a catamaran ride on the backwaters (charged extra), which may be a good thing to do for first timers. We did not try out their spa, although we’ve heard some good things about it. 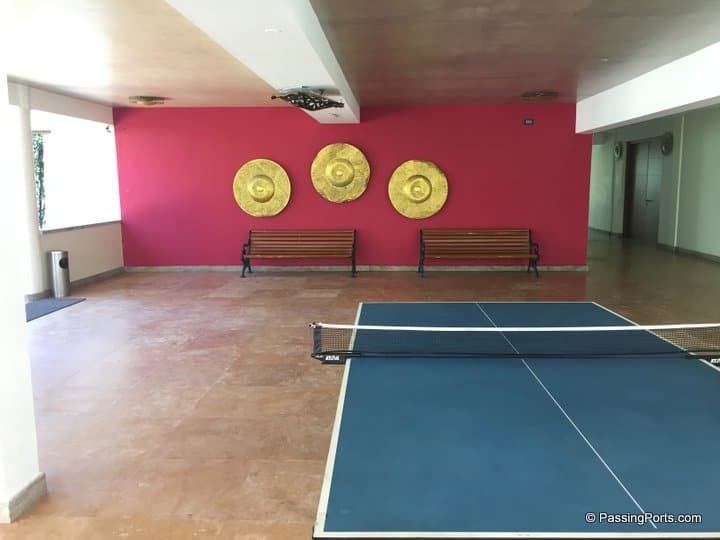 We were looking around for more indoor games such as carrom board, snooker table or foosball, games that are found in most resorts but couldn’t find any. Outside of the resort, there are a bunch of things to do in Pondicherry. We wrote a post recently on some of those activities in Pondicherry. We loved the rooms at the Windflower Resort Pondicherry. Extremely spacious, luxurious and done up well. While we may have had a partially bad experience (everyone has a bad day! ), the Windflower Resort Pondicherry is definitely one of Pondy’s best hotels, especially if you are looking to relax and not be disturbed by the outside world. Would we go back? Maybe, maybe not. Book your room now at the Windflower Resort Pondicherry on Agoda or Booking.com.